Sizable Send - Digital Wander, Inc. 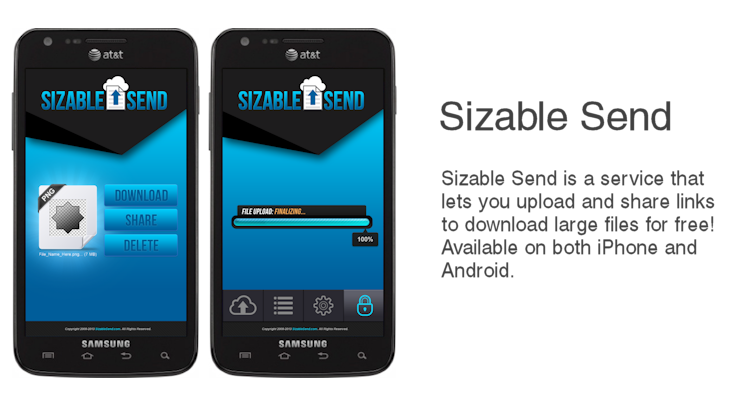 Sizable Send is the #1 RATED ANDROID/iOS APP for sending large files free of charge! Is your file too large to email or share? Securely share your large videos, photos, files or music on any social app or through email using Sizable Send. Up to 100GB per file! It’s so easy; you can send a file in 1-click. Plus, all your files are securely stored in the cloud indefinitely, until you delete them – 5GB of free storage is included. (Additional storage as low as $0.22/GB) SizableSend.com is the easiest and fastest way to send large files for free. And unlike similar applications there are NO restrictions on the amount of files you can send.